On the trail with Baraka. If I say we went for a hike today, it probably doesn’t summon up quite the right image of what it was like. First of all you have to understand that our hike was led by a park ranger equipped with an AK47. Tail-end charlie was a Maasai warrior. 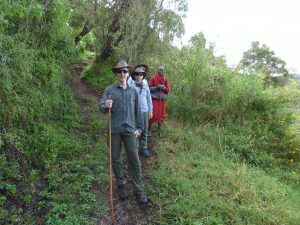 The hike itself was down the sheer, jungle-covered sides of the Empakai Crater, a series of switchbacks making the descent of the 300m crater walls practical, but a much longer walk than the vertical distance would imply. Our group was accompanied by monkeys in the trees and elusive small animals darting off into the undergrowth – there were presumably leopards also keeping an eye on us, but we didn’t see any of them. At the bottom of the crater wall the path abruptly exits the jungle on to a grassy sward and a thin, black sand, salt-encrusted beach surrounding the lake itself. 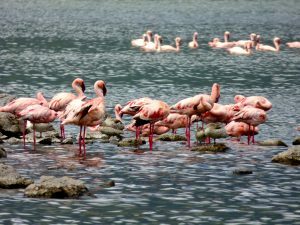 The lake is a circular soda lake which other than its awe-inspiring natural beauty, explains why we were there – it is home to flamingos. At first the only flamingos we saw were little better than dots in the distance. We walked about a quarter of the way around the lake anti-clockwise and didn’t seem to get any nearer to the birds so retraced our steps. All the while providing passing entertainment to some Masai kids who were spending their school holidays in the crater guarding a small herd of cows at the lakeside. The kids are about 7 years old and will spend weeks down there with only occasional adult visits. We were just about to give up getting up-close with flamingos and start our ascent, when Baraka, our Maasai guide pointed out that some flamingos had flown over a bit further clockwise round the lake. So we trekked over in that direction and were treated to a proper flamingo experience, seeing them standing and flying only a few tens of meters away. They really are an implausible looking bird. The walk back up the crater walls was devoid of any wildlife sightings, probably because our collective puffing and panting scared them off. By the time we got back to the top even our guides were sweating and puffed. Today is one of the local market days and so our drive back was accompanied by herds of cows, flocks of sheep and goats, and many, many Maasai. 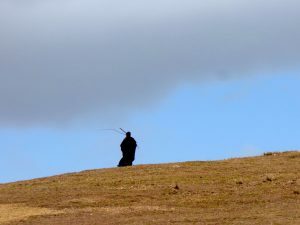 Often the Maasai were tiny little dots of colour in the midst of sweeping grassy plains. The scale of the plains is really hard to convey: The pictures we’ve taken just don’t communicate the expanses involved – and it’s all plain with hardly a tree to be seen. Tanzania’s third highest mountain provided a backdrop to much of our drive but it appears to be only a hill until you see something like the tiny human in the middle distance to give some sense scale to the whole thing. The lovely thing is that as we drive along people constantly wave and smile which provides a real feeling of humanity in the midst of all this huge, sweeping natural beauty.